"With stock of iMacs G5 dwindling and even selling out, the transition to Intel for the iMac line may be coming to a close. MacRumors is reporting that stock of 17" iMac G5s has completely run out at retail stores and is also no longer available from the Apple Store online. Additionally, 20" iMac G5s have been marked down US$1699 to $1499 (a fairly significant discount, in Apple-land) and running even cheaper out of the .edu store, which indicates a push for Apple to finally finish clearing out its iMac G5 inventory altogether sooner rather than later." "Apple has killed off the 17in iMac G5 - at least, the machine is no longer available from either the UK or the US online AppleStores, or stores throughout Europe and Asia-Pacific, though it remains listed on the main Apple website. The move comes just days after Apple cut the price of the 20in iMac G5 by $200 in the States and £150 in Britain. "It was widely assumed that the price cuts were intended to help shift remaining stocks of the iMac G5 as Apple migrates to Intel-based machines. The Core Duo-equipped consumer desktop - known simply as the 'iMac' - was only launched in the second week of January and began shipping at that time, so Apple's done pretty well to rid itself of the 17in PowerPC-based model in a month." Link: iMac G5 17in R.I.P. "Apple's iMac has been a hit since long before the latest version came out, but some extremely important changes under the hood pushed the newest version to the top of the Inspecting Gadgets 'things I'd like to review' list. "The iMac is the first Mac to employ Intel chips. With the faster speed the dual core processor brings, what was already a good computer is now very close to perfect." The latest computer from Apple uses a powerful new processor, but The Washington Post's Rob Pegoraro suggests it may be worth waiting for it to be debugged. "But most Mac programs aren't yet available as 'universal' Intel-PowerPC releases. In those cases, the iMac and such other Intel-based machines as the MacBook Pro laptop due next month rely on a layer of software called Rosetta to translate PowerPC code into Intel instructions. "Don't even think of using an Intel-based Mac without a gigabyte of memory on board, not the 512 MB that would suffice on other models." "The most remarkable thing about Apple Computer's newest iMac is that, even after using it for a while, it's hard to tell just how different it is from the identical-looking iMac G5 introduced last fall. Don't be deceived by the similarities. Hidden in the new iMac is a processor that will let this line of Macs grow and meet the increasing performance demands of software." "Quick Mac riddle: What looks like an iMac G5, sounds like an iMac G5 when it starts up, and feels faster than a Power Mac G5? "So how does the new iMac fare in regular use? This latest generation of Apple's all-in-one runs circles around its predecessor - most of the time." "The most remarkable thing about Apple Computer's newest iMac is that even after using it for a while, it's hard to tell just how different it is from the identical-looking iMac G5 introduced last fall. Don't be deceived by the similarities. Hidden in the new iMac is a processor that will let this line of Macs grow and meet the increasing performance demands of software. "It's going to take software developers a while to convert their programs, especially if they take pains to optimize the code for performance on Intel's twin processors. For example, Microsoft has pledged to write a new, Intel-specific version of Office for the Mac, but it's not saying when it will be ready." "Some users have been facing problems with the keyboard of their brand new iMac Core Duo. Randomly, but regularly, the keyboard freezes, and one needs to unplug it to solve the problem; till the next freeze." "Apple has confirmed that it's taken the number one spot in the western European education market. "Apple's education market share in western Europe is now 15.2 per cent, relegating Dell, with 14.7 per cent, to second place. "Durand also confirmed that according to Gartner figures, 'Apple market share in the UK education market during the fourth quarter 2005 was 12.5 per cent.'" "What was already a good computer is now very close to perfect. "With article titles such as 'Apple's Intel-based iMac is a Winner', 'It's iMac on Steroids' and 'iMac running on Intel is speedy', the iMac is not short of exaltation." PR: Last year, we introduced a new product: a CD-ROM archive of troubleshooting info published during the previous year on MacFixIt. Truth be told, we didn't really know how it would be received, but we knew we would find out pretty quickly. The response was quite clear: almost everyone who saw it wanted one, and expressed a lot of enthusiasm for the idea of us making this a regular product. So we produced another one this year, and made it available as a premium to subscribers to the VersionTracker Pro/MacFixIt Pro Bundle. Now that that promotion is over, we are going to sell the remaining stock of CDs; they will go fast, so get your order in now. Here's the deal: A Year of Fixes: the 2005 MacFixIt Archive CD-ROM, sells for $19.95 + shipping and handling ($2.95 for U.S. addresses, slightly higher for international addresses), and is available only through our websites. Click the blue button above (or the one below) to purchase. PR: The Kanguru QuickSilver features the latest in external hard drive technology with cutting edge SATA connectivity for the fastest throughput. The QuickSilver can take on your most demanding data transfer tasks with ease! Video streaming, photo editing and production, large-scale database access, the QuickSilver can do it all! As an added feature it also comes equipped with USB 2.0 for quick and easy connectivity to PCs and Macs without SATA ports. PR: Plextor Corp., a leading developer and manufacturer of high-performance digital media equipment, today announced the PX-EH family of Network Attached Storage (NAS) devices. 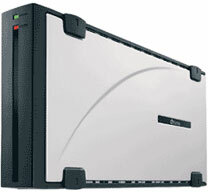 Available in two capacities - 250 GB and 400 GB - the external hard disk drives (HDD) are designed to allow multiple users to share data with fast performance assured by a high-speed processor and UltraDMA 133 HDD technology. The Plextor PX-EH series of NAS devices are designed for professionals and small businesses that require extra data storage capacity and easy backup capability. In addition to providing instantly accessible shared storage across the network, the devices include a print server that can share a USB-connected printer. Other built-in functions include an automated backup scheduler, administrative security, and the ability to configure the device as a dedicated FTP server. Throughput for FTP transfers is a fast 94.5 Mbps, compared to 60-85 Mbps for comparable products. The Plextor PX-EH Network Attached Storage devices are compatible with both Microsoft Windows and Apple Macintosh operating systems. Users enjoy silent operation thanks to the heat-releasing aluminum case and convection cooling design, which eliminates the need for a noisy fan. Set up is easy for customers with a DHCP server - just connect to the network and power up the unit. "As a leader in the data storage market, Plextor's mission is to help users secure and make the most of their valuable data," said Pete Schwartz, Vice President of Marketing and Business Development. "Plextor has now expanded its product lineup to include professional network hard disk drives. This product line extension complements our award-winning family of optical disk drives and gives our customers more choices for data storage applications." The Plextor PX-EH Network Attached Storage device family is shipping to distributors in North and South America on March 1st. The PX-EH25, with 250 GB capacity, has a Manufacturer's Suggested Retail Price (MSRP) of $299. The PX-EH40L, with 400 GB capacity, has a MSRP of $449. All retail packages include two-year full warranty and unlimited toll-free technical support. PR: SheepShaver is an Open Source PowerPC MacOS run-time environment. That is, it enables you to run PowerPC Classic MacOS software on your computer, even if you are using a different operating system. However, you still need a copy of Mac OS and a Power Macintosh ROM image to use this program. SheepShaver is distributed under the terms of the GNU General Public License (GPL). The following platforms are currently supported: Linux (i386, ppc, x86_64), MacOS X (i386, ppc), Darwin, NetBSD 2.0, FreeBSD 5.3 and Windows for x86. Please note that I am pretty careless of the Windows version since I am not a Windows developer. You are heartily invited to join the effort! An experimental port to Mac OS X 10.4.4 for Intel is now available. Please see the file README.html included in the distribution for details. If you are using a PowerPC-based system, applications will run at native speeds (i.e., without any emulation involved). On other systems, SheepShaver provides the first PowerPC G4 emulator, though without MMU, to enable the execution of Mac OS Classic. Performance with the current CPU emulator using basic just-in-time (JIT) translation techniques is roughly 1/8-th of native speeds.